As I suspected, yesterday we saw a down day on the usd to cad currency pair, with the candle bouncing off the 9 day moving average, adding weight to the move. The 9 day and 14 day have now crossed and the 40 day seems about to turn. More importantly the resitance area at 1.2200 seems to have been penetrated and provided this holds, we should expect further falls today, with a medium term target of 1.1800 region. My only slight concern is the pullback that occured on the candle yesterday evening, following the news from the US on FED funds rates and the FOMC policy statement. 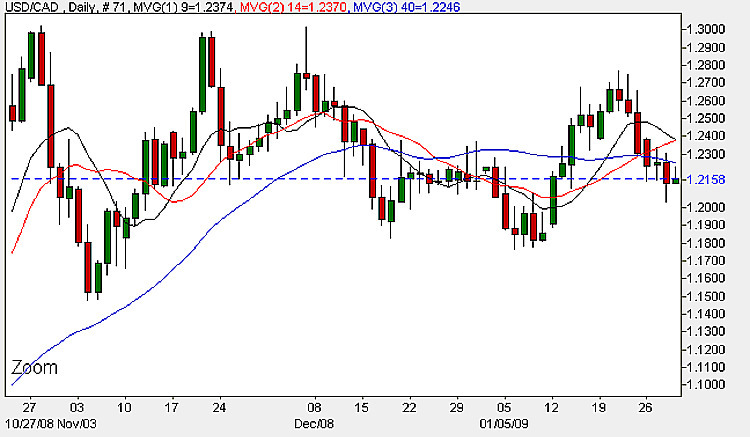 My strategy today would therefore be for small short positions, with a protective stop loss at 1.2750 or above. The fundamental news out today is primarily that affecting the US dollar, and details of these can be found on the euro to dollar site. In Canada we have the release of RMPI ( Raw Materials Price Index) which measures the change in prices paid by manufacturers for raw materials. The forecast is -10.1% against a previous of -13.4 last time. This is generally considered a leading indicator of consumer inflation, and if the actual exceeds the forecast, then this is generally good for the home currency, in this case the Canadian dollar. The other data being released is it’s sister report, the IPPI, the Industrial Product Price Index, which reflects the changes in prices of goods sold by manufacturers. Last time the figures were -2.6% with a forecast of -2.1% today. The short term is bearish, the medium term is sideways, and the long term outlookis bearish.